Now that America’s presidential debates have finished tonight, I have been pondering the future of Cuba-U.S. relations and the current embargo. Many Cubans are following this election closer than me. They are digging deeper than the propaganda they are fed from the country’s daily newspaper, Granma. Fidel Castro, who is supposedly ailing, wrote nearly a dozen editorials harshly criticizing America’s election process as well as John McCain and Barack Obama. Many Cubans, however, are not falling for this rhetoric that has lasted nearly a half century. The young people (Keep in mind that almost 73% of the island is under the age of 50. ), especially, want an open travel policy with the U.S. They are more exposed to the world than their parents and grandparents thanks to their limited use of internet and television. Ideas are changing, if not out in the open at least in the minds of the young people. A few young Cubans I know have added me as a friend on Facebook. They are also are in touch with reggaeton music and the latest MTV music videos. There is an overwhelming majority who prefer Obama to McCain, not because he’ll necessarily be the better president for the U.S., but because of Obama’s stance on the current embargo versus McCain’s view. NBC News reporters interviewed 100 people in the streets of downtown Havana with the following results: 63 said they preferred Obama, 2 preferred McCain, 13 had no preference, and 22 declined to answer. The Cuba-U.S. blockade began during the Cold War. Recent American presidents have only continued the bloqueo to win votes in South Florida. This blockade is so obviously political when you consider: the anti-Castro community in Miami, Cubans are very hospitable to American tourists visiting their island, and America is still the seventh largest exporter to Cuba (4.3% of Cuba’s imports are from the U.S.). But Cuba needs even more help now. It was the worst hurricane season in Cuban history this summer with an estimated $5 billion of damage. Supplies have always been scarce but in many places it is feeling like a flashback to the “Special Period.” An estimated 500,000 Cubans are living in government shelters due to the damage from Hurricane Gustav and Hurricane Ike. 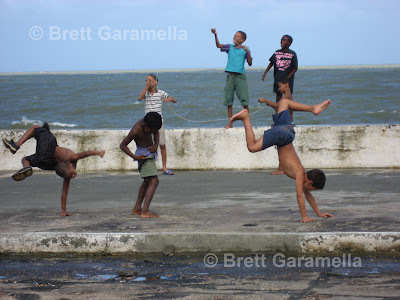 In January 2007, I took this photo of local children flying kites and hanging out on the malecón in Baracoa, an eastern town in Cuba. Hurricane Ike devastated Baracoa, causing five-story waves last month (September 7, 2008). The chance of U.S. help won’t happen until President George Bush leaves office. Under Bush’s tightened restrictions, Cuban-American families can only visit their relatives in Havana once every three years. This means if you are a Cuban-American with a dying father, you cannot visit him on his deathbed in Cuba if you’ve seen him in the past three years. And when you do arrive, you cannot give your family more than $300. How does that help family values? Many Cubans are asking the same question. They believe Obama might be their answer.